People are usually shocked when I tell them I eat meat. Even good friends of mine do a double-take when I order chicken at a restaurant. And if your knowledge of my diet was to come strictly from my recipe postings, then you would probably be under the impression that I'm a vegetarian with pescatarian tendencies. But nope - this canary is omnivorous. It's a funny thing, the way all of my constraints converge. Looking at my eating choices, easily 60-75% of what I eat is indeed vegan: grains and noodles, tofu, tempeh, and beans, salads, stir-fries, and roasted vegetables, nuts, seeds, and fruits. But if there's one thing that I truly crave, it's animal protein. It's usually chicken, eggs, turkey, tuna or shellfish, but on rare occasion I will eat pork or beef. And I've found that it's a delicate balance, especially given how active I am. If my diet errs on the side of more meat and less vegetables, my body sends me a warning or two to ease up a bit. But if I err on the side of too little meat and more vegetables, my body communicates in a way not unlike a drill sergeant exercising his full vocabulary of expletives over a bullhorn. So when I feel a craving for meat, I do my best to listen. And that was exactly how today's recipe came to be. I was in the grocery and I saw a special on organic grass-fed beef. If you ask me how many times I've purchased beef to cook at home, I could count it on one hand. But meat was on my shopping list, and seeing this special, I figured, "Why not?" Driving home, I started brainstorming what to make with it and settled on meatloaf. Easy, comforting - perfect. Putting away my groceries, I was reviewing the ingredients I would need and realized that I was out of eggs. I was just about to head out the door when I thought, "Do I really need eggs to make meatloaf?" Coincidentally, just a couple days earlier I had a discussion with someone about their intolerance to eggs and it made think of how one would negotiate that constraint. So I turned around, went back inside, and got to work on a meatloaf fit for a canary. 1. Dice onion and saute for 2-3 minutes over medium or until translucent. Thinly slice garlic and saute for 1-2 minutes. Once cooked through and aromatic, remove from heat and set aside. 2. Pour warm stock over gluten-free oats. 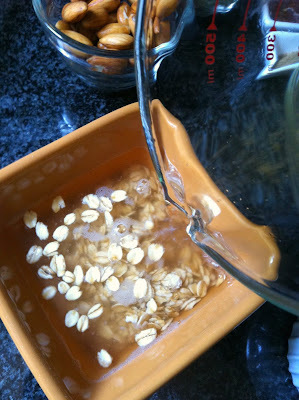 Allow oats to reconstitute (5-10 minutes). 3. Make flax "egg." Add the 3 tablespoons warm water to the ground flax. Stir and then allow to sit for about 5 minutes. It should achieve a consistency similar to egg-whites. 5. In a food processor or blender, combine soaked almonds, pumpkin seeds, and chia seeds. Pulse until nuts and seeds have been ground to a uniform consistency. 6. 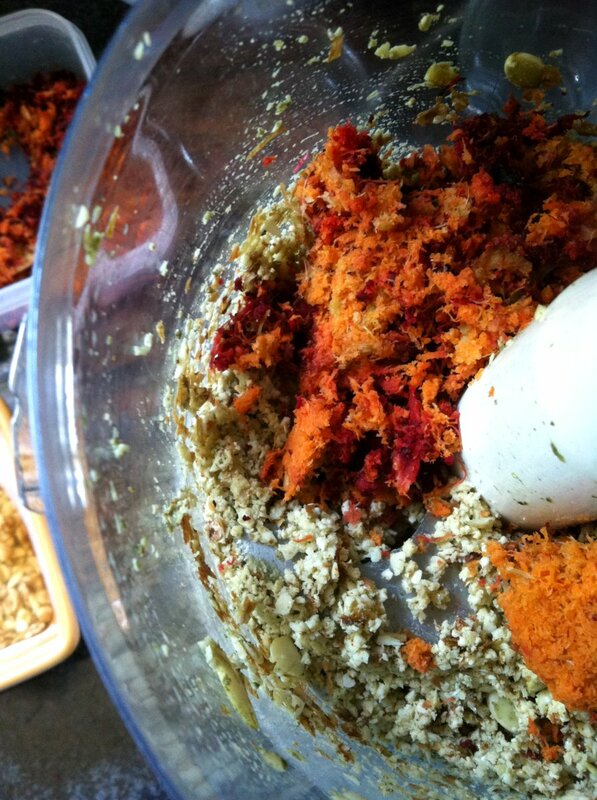 Add spices, pepper flakes, and nutritional yeast. Pulse to combine. 7. Add grated vegetables. I had juiced beets, celery, carrots, and apples earlier, so I recycled those scraps for this recipe. Pulse until combined. 8. Transfer mixture to a large bowl. 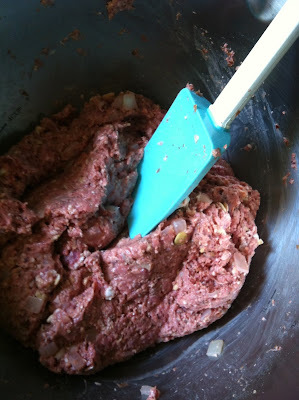 Add sauteed onion and garlic, reconstituted oats, and ground meat. 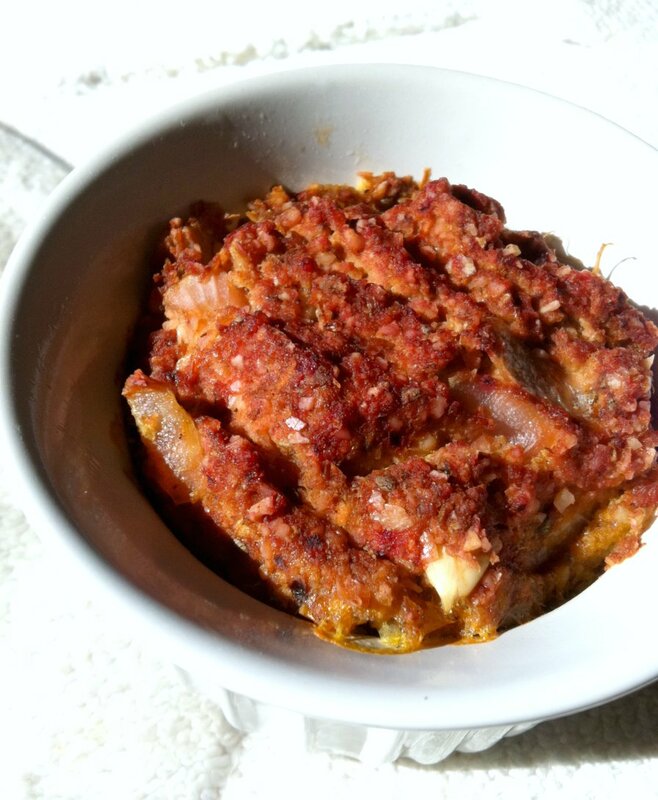 Besides beef, ground turkey, pork, bison, or a combination of any of them would also work well. Season with salt and pepper. 9. 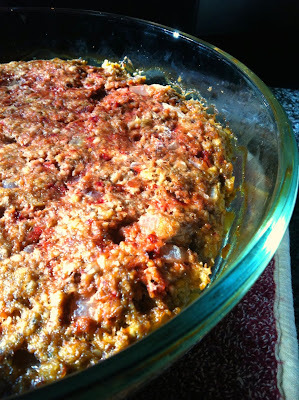 Spread into a cooking pan, being careful not to pack it too densely. Instead of a loaf pan, I opted to use a round casserole dish. 10. Cook for 1-1 1/2 hours or until internal temperature has reached 160 degrees. 11. 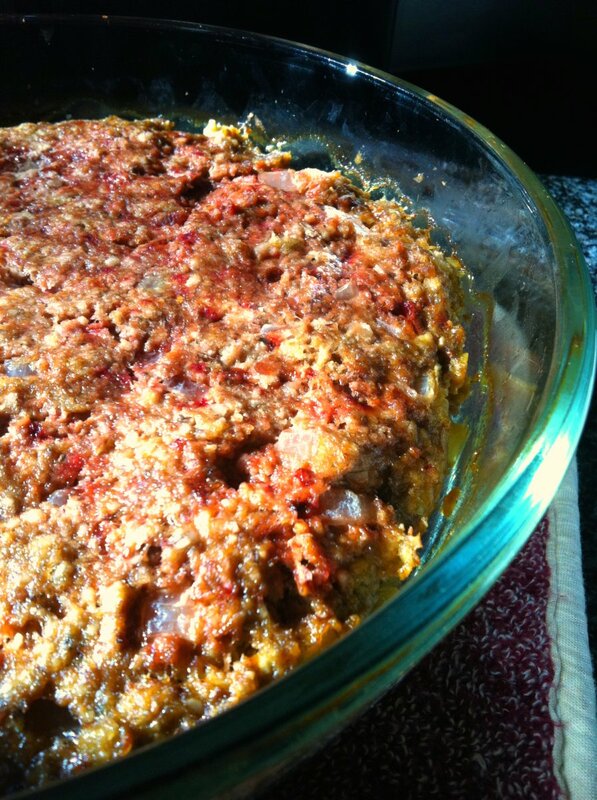 When finished, remove from oven and allow to rest for at least 10 minutes before serving. As with most meatloafs, this makes even better leftovers, so time permitting, I'd definitely recommend making this a day in advance. I know a lot of people like to eat their meatloaf with ketchup or a tomato glaze on top. Personally, I've never had it that way and come to think of it, I don't really eat ketchup in the first place. But I thought that perhaps I could tip my hat to that tradition and spread some sriracha on top. It turned out to be the perfect complement to all those hearty flavors. Highly recommended. Also, while blending the nuts, seeds, and juicing scraps, it was amusing to me how much it resembled ground meat in color (due to the beets). So I took some of that mixture, and after adding some of the reconstituted oats, baked it on its own in a small ramekin. The result was very similar, in both taste and texture, to the filling of vegetable gyoza. No approximation of meatloaf, but tasty nonetheless. I added a few drops of gluten-free tamari, some sriracha, and this camper was hummingly happy. Neatloaf? No. But neat, yes. Utilizing other ingredients instead of eggs to bind the meatloaf together, finding yet another use for juicing scraps (there are so many! ), and creating something that would make both my mouth, my body, and my mind happy - a wonderfully satisfying challenge. This recipe was the result of a craving, a sale, and a 'make it work' moment, and it required me to think on my toes and be extra creative, which just so happens to be my favorite way to play in the kitchen. Oh no meat! =) I'm a vegetarian, but I know that being as such; it is a choice. I am not offended by people who eat meat; I'm only offended when people do not have an appreciation as to how they were able to enjoy their steaks, burgers, nuggets, kebabs etc. I'm all about conscious eating. Anyhow, you'll hear more about that in some entry I'll post on my own blog one of these days. About the meatloaf: I remember when I was growing up and our Mom would make the meatloaf sometimes out of beef other times out of turkey and put either hotdogs or hardboiled eggs in the center. We used to love eating it with ketchup. It was a comfort food and a pretty simple one at that. 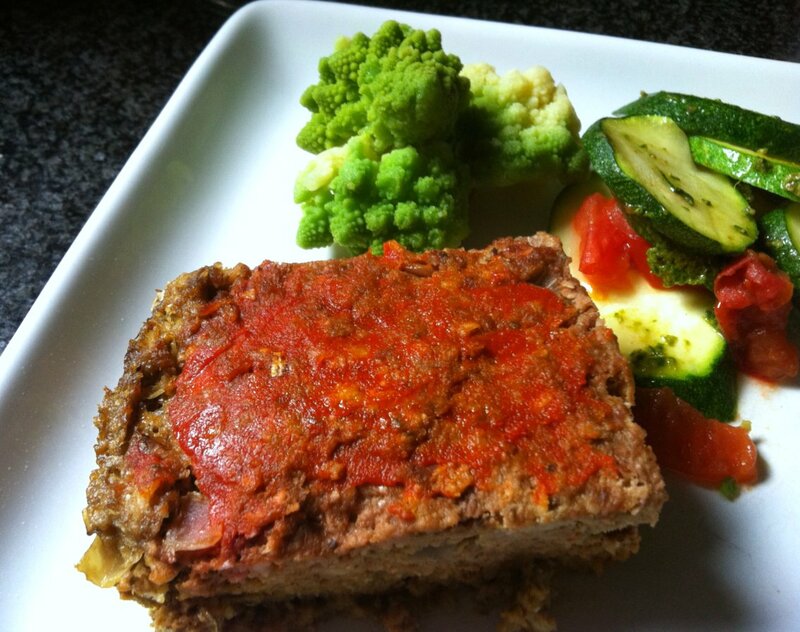 The recipe that you came up with for your meatloaf reminds me a lot of the grain and nut veggie burgers; I could easily sub in some ready made lightlife brand gimme lean or even start with some TVP. I've made vegan Filipino Longanisa with TVP; the tricky thing is binding it and I think the oats and flax should probably be alright;maybe a touch of tapioca flour. I might make some later this week; I'll let you know how it turns out. Excited to hear how your veggie version turns out!